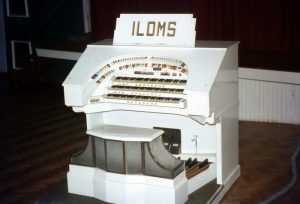 The Christie organ was originally installed in the Century cinema, Clacton, Essex, and opened with the cinema in July 1936 with Frank Matthew at the console. The 7 original ranks were: Tibia, French Trumpet, Tuba, Vox Humana, Open Diapason, Concert Flute and Viol d’Orchestre plus a synthetic Orchestral Oboe and Saxophone, all played from a unique 3 manual illuminated console. Subsequent organists included Clement Elliott, Harold Ramsey (not the Harold Ramsay of Union fame,) Crosbie Scott and Kit Francis. The Christie was purchased by the Ipswich Light Organ Music Society in 1967 with a view to installing it in Ipswich Town Hall. However, it eventually arrived at Castle Hill United Reformed Church and was opened on 21 November 1971 by Len Rawle and John Mann. John had played the farewell concert at Clacton almost exactly four years earlier. There have been some additions including a Compton Clarinet, String Celeste and a 16ft Diaphone. The huge illuminated surround was discarded and eventually replaced with wooden ‘Granada-style’ ends from the Adelphi cinema, Slough. These ends are removed after concerts and an oak surround fitted to give it the appearance of a church organ.